The newest iPhone generation supports built-in wireless charging—finally—so that means Lightning cables are no longer a must-have accessory, right? Wrong! Even if you fully embrace the wireless charging life, you’ll still find yourself in plenty of situations where balancing your phone on a wireless charging mat just isn’t feasible. It’s hard to wirelessly charge a phone without a still, flat surface, so when you’re traveling, commuting, or just trying to use your phone while it charges, you’ll still need to use a Lightning cable. In fact, Lightning cable quality will be even more important with wireless charging, because you’ll mostly be using the cable when you’re moving, twisting, or jostling your phone around. This will put more stress on the connector, something that Apple’s original Lightning cable just can’t handle well over time. In other words, it’s time to start looking for better options. You only get one Lightning cable with your phone (and it’s probably already broken), so you’re going to need to stock up—but not at the Apple store. 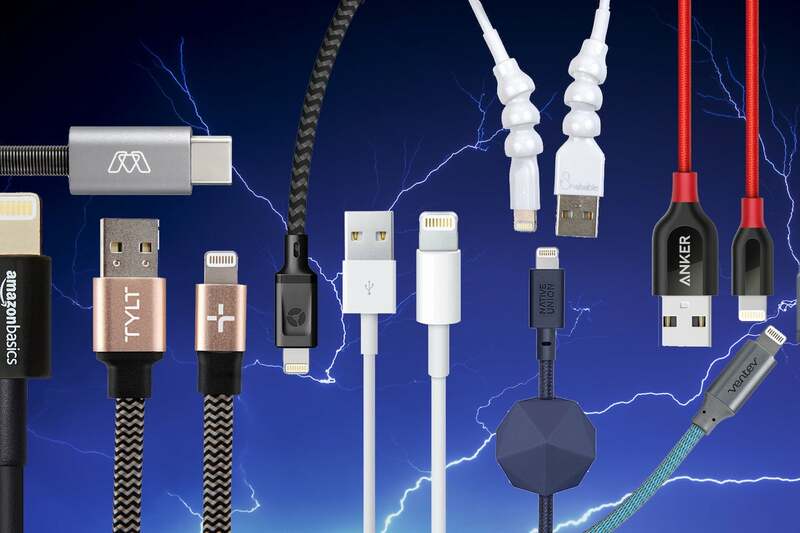 We tested 10 Apple-approved Lightning cables over the course of a month to figure out where you should spend your money. Read on to find out which cable is the best, and what we thought of the others. See the list of cables we reviewed at the end of this article. The Anker PowerLine+ is basically everything you want in a Lightning cable. This premium, nylon-wrapped cable is super durable, comes in a variety of colors and lengths, and it won’t leave you broke. The PowerLine+ comes in four colors (gold, gray, red, and white) and four sizes (1 foot, 3 feet, 6 feet, and 10 feet), and costs between $13 (for the 1-foot version) and $17 (for the 10-foot version). The slim, round cable is made with ultra-strong aramid fiber and is wrapped in a double-braided nylon sheath. The Lightning connector and the USB plug are housed in tough plastic, which is laser-welded to a more flexible rubbery material at the cable’s stress point. One of the only caveats here is the Lightning connector’s housing—it’s at least a full millimeter larger than the housing around the Lightning connector in the Apple cable, and this could be an issue if you have a snug, waterproof case on your phone. Nomad’s basic Lightning cable isn’t cheap—the 1.5-meter version costs $30 (we found it on Amazon for $16), and the 3-meter version is $35, but it’s one of the most well-made cables I’ve ever used. Nomad’s Lightning cable is thicker and heavier than other cables we tested, but it’s also designed to withstand heavier use. The cable features a Kevlar core cloaked in a fire-resistant PVC jacket and wrapped in “ultra rugged” black and gray ballistic nylon. The quality is definitely there, but the real question is whether you need an ultra-rugged, ballistic nylon-wrapped super-cable. And, for most of us, the answer is… not really. If you’re just going to plug your phone in next to your bed each night, you don’t really need a cable that can pick up 10-pound kettlebells. The Native Union’s Anchor 6.5-foot cable has its own sliding weight, which is designed to help prevent the cable from falling off of your nightstand or desk. The Native Union Anchor cable comes in two colors (marine and taupe) and one length, and features a movable skid-free geometric weight. The weight, which has a soft-touch matte finish, slides along the entire length of the cable without slipping—it stays in place when you’re not sliding it yourself. Native Union has done its best to combat strain on the cable’s necks with a special “O-FLEX” strain relief design. This is basically just a small opening on either side of the neck, for easier, less-strained flexing. Native Union’s cable is probably my favorite nightstand cable: It’s long enough that you can easily use your phone while it’s charging; it’s got that nifty attached anchor to keep it on the table; and it’s definitely durable enough to withstand lots of half-awake plugging and unplugging. Every new iPhone and iPad is bundled with one of Apple’s original 1-meter Lightning to USB cables, which retails separately on Apple’s website for $19. But despite being the cable that comes with your phone, Apple’s cable just isn’t the best option out there. The cable’s weakest point is its neck, where the soft-touch cable meets the plastic connector housing. The neck is slightly reinforced with an extra piece of rubber, but it’s just not designed to withstand the daily pressure we usually put on our cables. Apple’s cables aren’t worth $19, but the cable that comes with your iPhone is covered under your device’s limited one-year warranty against defects in materials and workmanship. So if your cable ends up frayed to the point that it’s unusable, it’s worth heading to an Apple store to see if they’ll replace it. You can walk into just about any corner store and find a ton of different Lightning cables for sale, some as low as $1. But you should probably resist the urge to buy a handful of ‘em, because they’re not certified and they’re certainly not worth the $1 you paid for them. At best, an uncertified Lightning cable will work for a few days or a few weeks before it suddenly goes belly-up, and your iPhone spits back a “this accessory is not supported” message every time you plug it in. At worst, some uncertified cables can actually damage your phone’s charging port, and then you’ll have to use that wireless charging mat. Uncertified cables are totally unpredictable, and they almost always stop working fairly quickly. We only tested MFi-certified cables—cables that are licensed and approved by Apple, even if they’re not made by Apple. Because MFi-certified cables require manufacturers to go through Apple for parts and approval, they’re more expensive than uncertified cables (and MicroUSB cables, which aren’t proprietary). But they’re not that expensive—the cheapest cable in our round-up is $6. To determine which cable was the best, we tested all of these cables over the course of a month. For the most part, we kept our tests to real-world stresses—yanking, pulling, twisting, tying, running over them with office chairs, dangling them in front of dogs, and occasionally seeing how much weight they could lift (just in case you ever need to use your charging cable as a makeshift rope). There are a lot of more extreme tests we could have done, but we really wanted to see how these cables held up with normal use—the average person doesn’t accidentally drop their charging cable into a blender, for example. All of the cables tested had good and bad qualities, and we were really looking for those weak spots: If a cable is broken or frayed after just a month of testing, it’s probably not going to last the whole year. We also took price, convenience, versatility, and other features (such as lengths and options) into account to determine our winner.